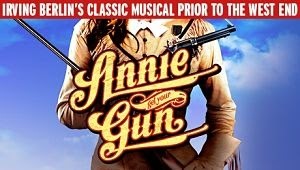 The tour of Annie Get Your Gun starring Jason Donovan , Emma Williams and Norman Pace (as Buffalo Bill (until September) is due to end earlier than planned and will now finish at the Wimbleon Theatre on 13th September. According to The Stage the producers (Ambassador Theatre Group and Tulchin/Bartner Productions) have cancelled The final two dates at Aberdeen His Majestys and Torquay Princess Theatre which is where it was due to end on 4th October. In a statement from the producers they said: Despite encouraging ticket sales and every effort being made to try to safeguard this show for our audiences, the picture across the tour led the producers to make the decision to cancel the remaining performances.